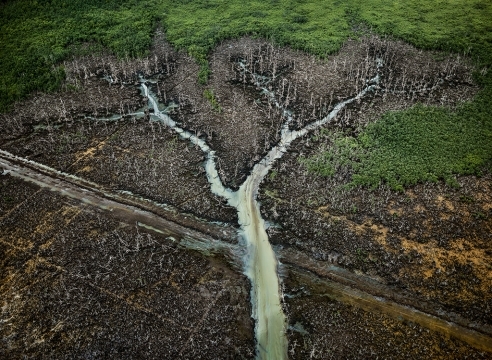 Two gallery exhibitions of landmark work from photographer Edward Burtynsky’s series Anthropocene, which maps the unprecedented impact of human intervention on Earth, will be on view at Howard Greenberg Gallery from November 14, 2018 – January 5, 2019, and at Bryce Wolkowitz Gallery from November 15 – December 29, 2018 in New York. Opening receptions will be held at Howard Greenberg Gallery on Wednesday, November 14, from 6-8 p.m. and at Bryce Wolkowitz Gallery on Thursday, November 15, from 6-8 p.m. The artist will be present at both receptions. Burtynsky’s Anthropocene marks the latest addition to his career-spanning investigation into impact of human activity on the environment. The project title refers to a proposal circulating in the scientific community to formally recognize the commencement of a new geological epoch – the Anthropocene – in which humans are the primary cause of permanent planetary change. The Anthropocene exhibitions coincide with the release of Burtynsky’s sixth Steidl monograph of the same title; a new documentary, ANTHROPOCENE: The Human Epoch, which premiered at the Toronto International Film Festival in early September; and two museum exhibitions that opened to the public September 28, at the Art Gallery of Ontario, and at the Canadian Photography Institute of the National Gallery of Canada, respectively, all in collaboration with award-winning filmmakers Jennifer Baichwal and Nicholas de Pencier. For The Anthropocene Project, Burtynsky visited 20 countries on every continent except Antarctica, including the United States, Canada, France, Germany, Norway, China, Indonesia, Malaysia, Kenya, and Nigeria. The exhibitions – with photographs dating from 2012 to 2017 – highlight the artist’s visual exploration into the global consequences of coastal erosion, logging, mining, and industrial agriculture with subjects ranging from the surreal lithium evaporation ponds in the Atacama Desert in Chile to the psychedelic potash mines in Russia’s Ural Mountains. For 35 years, Burtynsky's photographic projects have led him around the world, recording the intersection of industrial growth and environmental consciousness. His previous subjects range from urban renewal centers and housing projects to recycling yards, rock quarries, and the skeletons of decommissioned shipping vessels and containers. Currently under vigorous and passionate international debate, the acceptance of the controversial idea of the Anthropocene would represent a formal recognition and acknowledgement of what Burtynsky, Baichwal, and de Pencier call the "human signature" on the planet. "Humans have always taken from nature,” states Burtynsky. “This is normal, part of the human condition, and, indeed, a fact of life for all life forms. What is different now is the speed and scale of human taking, and the Earth has never experienced this kind of cumulative impact. If my images appear surreal at times, it must be remembered that they depict our extractive world as it is."